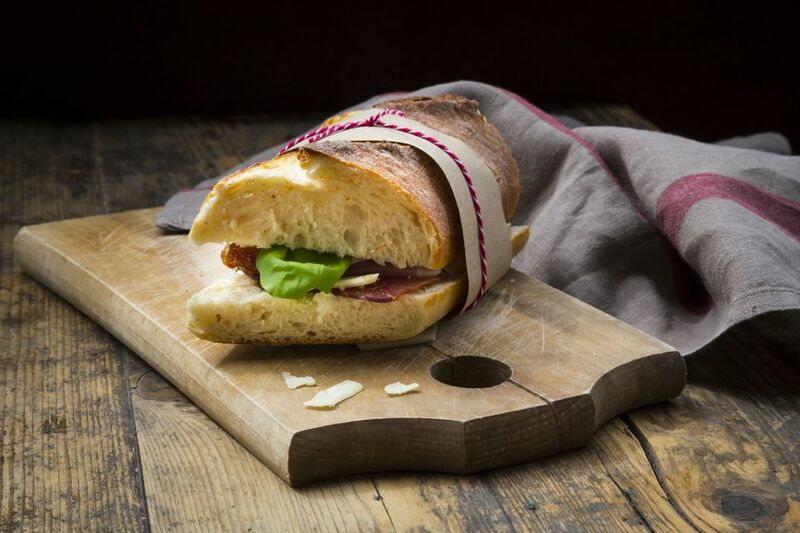 Jambon beurre is, quite simply, a ham and butter sandwich in a baguette. It is simple, delicious and a classic of French food. The architecture is simple: start with a quality baguette, sliced lengthwise down the middle, spread the cut interiors with a bit of butter and layer in thin slices of ham. That's it. It really is that simple and delicious. Cook's note: No exact amounts have been given for this recipe because the ham to bread ratio is entirely up to personal taste. Slather a healthy amount of butter on the bread to "seal" the sandwich together and give it a rich flavor, but not so much as to make it greasy. Slice the fresh baguette lengthwise. Spread the softened butter onto the cut surfaces of the bread. Layer the ham onto the butter; how much you use is entirely up to you. Add a few salad leaves or even a few slices of tomato–understand that this is not a classic way of serving but does add an extra dimension. Sandwich the baguette together and serve the jambon beurre chilled. Store the sandwich in the refrigerator for up to one day. This makes a perfect picnic menu item. Ham with a buttered baguette is only one of many French classic sandwiches. The addition of a little mustard can switch this sandwich very quickly into something else. Please use French or Dijon mustard (not English). Add a little salad (not just the leaves) to the ham and butter and serve. If using tomato, do not keep the sandwich as the tomato will make the sandwich soggy. Always add at the last minute.